Broke and busy, I couldn’t get it together to go away. Instead, I had this great plan to fool myself into thinking I was abroad by having a dish a day from holidays past. I did have two successful meals but a hundred and one things came up and I ended up barely sitting down to dinner at all. Disgruntled and over-worked, I said to hell with it, booked myself on a plane and headed over to Spain for five days. It was the smartest decision I have made all year and although it was a short visit, I returned home totally revitalised. 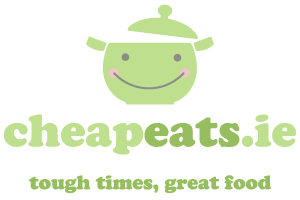 Spain is an amazing country and a really cheap culinary destination. I usually try and pick up a few classic Spanish products that will see me through the winter. I came home ladened down with proper chorizo, Manchaego cheese and Spanish brandy. 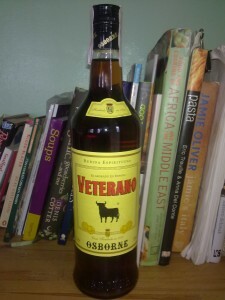 You can pick up a 1 litre bottle of Veterano Spanish brandy at the airport for €7.50 which will give added flavour to many dishes – such as Mitchell’s beef stroganoff – and is also delicious enough for a tipple despite it’s low price. Oh, and it works great in a pepper sauce too. This Spanish chorizo and brandy chicken recipe incorporates all my newly purchased produce and makes a hearty meal for four. You can use any brandy and substitute the Manchaego cheese for Parmesan if you so wish. For the chicken, heat the oil in a pan over a medium heat and cook the chicken portions, turning frequently, for about 5-6 minutes, or until browned on all sides. Meanwhile, bring the stock to the boil in a large saucepan. Stud one of the onion quarters with the two cloves and add to the pan along with the remaining onion quarters, the chicken, carrot, celery, bay leaves, thyme, paprika and garlic. Simmer very gently, uncovered, for 30-45 minutes, or until the chicken just starts to fall apart. Remove the chicken from the pan and place into a roasting tin. Strain the stock through a sieve into a bowl. For the sauce, return the strained stock to the pan, bring to the boil and simmer until the liquid has reduced by half. In a bowl, for the sauce, mash the flour and butter together to make a paste (this, in chef terms, is a beurre manié). Whisk this paste into the stock along with the brandy and simmer for 3-4 minutes, until thickened and smooth. Add the chorizo and season, to taste, with salt and freshly ground black pepper. Pour this sauce over the chicken in the roasting tin and sprinkle over the grated cheese. Transfer to the oven and bake for 10-15 minutes, or until the cheese is bubbling and lightly browned. To serve, place portions of the chicken onto four serving plates and serve with the jacket potatoes and green beans.